Ask any Ukrainian about Borscht, and they’re likely to tell you that the only version worth its salt is Ukrainian Borscht! In fact, so highly revered is Borscht in the Ukraine, that it is their national dish, and one of which they are unashamedly proud. However, ask ten Ukrainians how to make Ukrainian Borscht, and you probably won’t get the same answer from any of them! The reason for this, is that there are so many variations on the basic Borscht theme, there is no exact method of preparing it. Over the years, a number of regional variations have developed – many with their own special name – and with Ukrainian women further personalizing their own recipes, it is unknown as to precisely how many different versions of Ukrainian Borscht exist today. 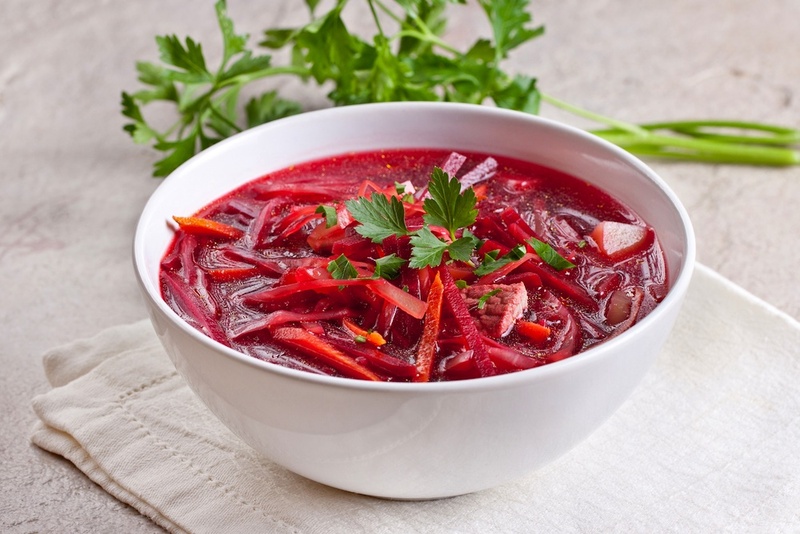 Much like the Borscht to be found in other part of central and eastern Europe, Ukrainian Borscht can be served cold, but more often than not, it is ladled into bowls from a large pot, steaming hot, and fit to warm the recipient to the very core. Taken from an old Slavic word for beet, “br’sch”, or Borscht, is essentially an earthy, unpretentious, home-cooked meal. Ukrainian cuisine is well-known for the large number of ingredients in its dishes, and Ukrainian Borscht is no exception. Either made with a vegetable or meat-based stock, this thick and wholesome soup can contain pork (which is most traditional in the Ukraine), sausage, chicken or beef, together with beets, potatoes, carrots, a selection of whatever beans are available, e.g. ; runner beans, broad beans, green beans, white beans, etc., cabbage, celery, mushrooms, tomatoes, fresh herbs and garlic. Of course, if preferred, the meat can be omitted completely for an equally tasty vegetarian version. Because of the diversity of ingredients, it’s important to ensure that when cooking Ukrainian Borscht, the beans, vegetables and meat are added to the stock in order of which takes longest to cook, to prevent the finished dish from containing a mixture of perfectly cooked, undercooked and overcooked ingredients. As time consuming as it can be, cutting everything into small, similar sized pieces is the best way to avoid this. In my opinion, Ukrainian Borscht is best enjoyed with plenty of freshly ground black pepper, a handful of freshly chopped chives (yes, I know it’s a lot, but I love their flavor in this! ), and a generous dollop of cold sour cream swirled into the steaming hot soup – I haven’t been able to get hold of Smetana, but I’m told that regular sour cream is pretty similar. However, I have made the Pampushki, which were surprisingly easy and totally amazing – just perfect for dunking! When people talk about food tasting better the next day, it certainly is the case with Ukrainian Borscht, so if you make too much to finish, put it into your refrigerator in an airtight container and it’ll keep for up to three days. Give it a try if you can – as a first course, or a main meal, Ukrainian Borscht is a sure-fire winner! Cut the meat into pieces (and place them in a pot filled with cold water. Bring to a boil and skim off any fat on the surface. In 30 minutes add the soaked beans, cover and cook for about 1 hour. Cut the salted salo into tiny cubes. Chop the head of garlic and the dill. Grind them together in a deep bowl with a wooden spoon and throw it into the cooked borscht. Wait for 10-15 minutes more, even if you find it hard to resist all of those delicious smells. Add a table spoon of sour cream in your soup bowl; sprinkle with a little bit of chopped parsley and dill.